Andrew Edey, 11 year old son of Tillmouth Park boatman and Help for Heroes swimmer, John Edey, showing his four pound sea trout caught in the Hut Pool at BlueStone; which he then swiftly and neatly released. 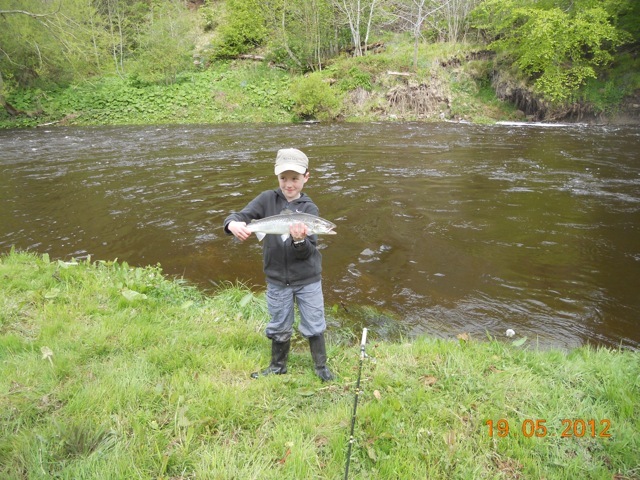 During the week young Andrew landed two salmon and a sea trout for his two visits to the beat, contributing to the weekly tally of 9 salmon and 1 sea trout. Also on Saturday afternoon local angler John Pilling from Hutton landed a sea liced 7lb salmon from the tail of Swan’s Nest. This entry was posted in Uncategorized and tagged Angling, Bluestone, FishTweed, gillie, River Tweed, sea trout, season 2012, seatrout, Tweed, Tweed Valley. Bookmark the permalink.